The RSS Externally Fed Rotary Drum Screen are constructed slotted stainless wedgewire, cylindrical drums that rotate on two pillow block bearings. The screen typically has lot openings range from 0.100 to 0.010 inches. These screens feature 100% overflow protection from blinding for flows up to 5.0 mgd. 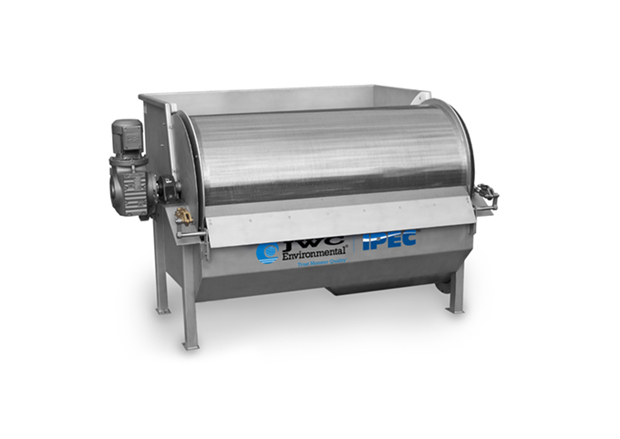 Raw influent enters a headbox which distributes the flow evenly across the full length of the rear, upper external surface of the rotating drum screen. As water passes through the screen, solids are retained on the outside of the screen drum and are carried by rotation around to the front of the screen, where they are removed by a fixed doctor blade. The screened water cascades down inside the drum and falls through the bottom, creating a vigorous backwash action. This action, together with the use of internal water sprays, has a combined effect to self-clean the drum on every revolution.